Mickey Harte has once again opted for wholesale changes for Tyrone’s McKenna Cup decider against Cavan at Athletic Grounds this Saturday night, January 24. Twelve of the line-up that started the semi-final against Armagh drop to the bench, with Killyclogher rookie Conal McCann holding his place in midfield. 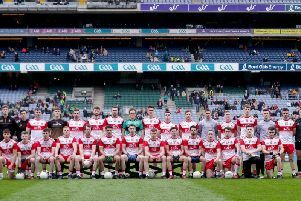 Sean Cavanagh and Ronan O’Neill also retain their places as Tyrone look to make it a fourth McKenna title on the trot. McCann and O’Neill both featured for their universities in the group stages, St Mary’s and UUJ respectively. After a quartet of Clonoe players started against the Orchard county on Wednesday night, only goalkeeper Michael O’Neill remains on the 26 player panel. Dungannon rookie Padraig McNulty makes his way back into the team to partner McCann at midfield, whilst Niall McKenna will get his first start of the year in a team that closer resembles the side that took on Antrim in the final group game. The game will be televised live on BBC via the Red Button.